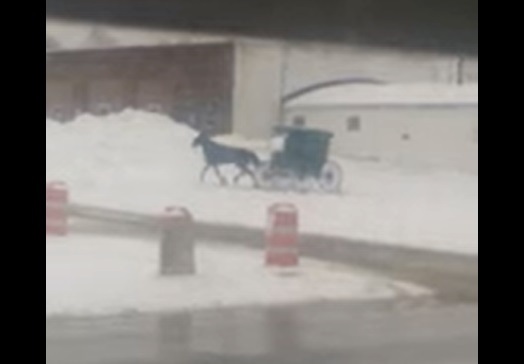 This 19-second video shows an Amish buggy doing donuts in the snow (snonuts?). It was filmed in Polk, Ohio (Ashland County), by Shayla Buhl, employee of the Polk Market and Deli. “I just looked out the window and grabbed my phone. They had it up on two wheels at one point,” Buhl told Fox 8 Cleveland. Ashland County contains all or parts of three Amish settlements. Given the location and look of the buggy (open front & no SMV triangle), this is probably someone from the Lodi/Homerville Swartzentruber community. Any guess who might be behind the wheel? I’m going to go out on a limb and say this is probably not an Amish grandma killing time while a pie finishes baking. This video has been making its rounds on Facebook and in some former-Amish groups to which I belong. 🙂 Yes, they like to have fun. Our SIL (former-Swartzentruber Order) told us about the time he was racing with another buggy. He lost control and ran through a farmer’s corn field. When he got home, the Amish “CSI” came and found the corn husks tangled in his wheels. Brings back high school memories, except it was a pick up truck, and I was *not* at the wheel. The high school memory it brings back for me is not of a deliberate “doughnut,” but one my car did without my permission when I tried to stop at an intersection that turned out to have glare ice. As a more experienced driver now, I think I MIGHT be able to steer out of the skid if such a thing happened again, but I remember doing a complete 360 degree spin, coming within a couple of feet of other cars, then coming to a stop behind the car in front of me, perfectly placed in my lane and facing exactly forward, just as if it hadn’t happened. I’ll tell you, that was one of the longest two or three seconds of my life! I think the buggy driver in the video is having more fun than I was, though I suspect the horse is a little confused. I tried it once on gravel and rolled the buggy. I broke a brace on the dashboard, which I got the neighbour’s boy to weld. A piece of harness broke but I replaced it with a piece of an old harness. I thought I had my sins well hidden but on Saturday, the boss mentioned something about driving decently tomorrow! I never tried it again. An old neighbour told of the time he tried that on ice with a car with wooden wheels – he hit a chunk of ice a broke the wheel! Polk is not that far away from where “Mark – Holmes Co.” is, I think it MUST be him doing this! *smiles* At least I sure hope he is out having some fun. Another kind of "donut driving"
Does the Rise ‘n’ Roll bakery in Lagrange County have a drive-thru window? I had the same thought Alice Mary. I don’t think the horse is having much fun. While driving through bucolic countryside in New Wilmington, PA the tranquility of the landscape suddenly came alive with a farm wagon pulled by two horses moving at record speed down the country road. The Amish man at the reigns was standing in the wagon as the horses moved for all they were worth, mains flying and a dust cloud trailing behind them. They approached an intersection and barely slowing down took that corner on about two wagon wheels! We couldn’t quite believe what we’d just seen!, and wondered if the horses had been spooked or something before the driver could bring them under control. As coincidence had it, we turned into the same farm lane as the wagon and driver, there was a store on the farm that sold items we were interested in. Except for a few cats and many kittens about everything was unusually quiet. No one appeared home or at the store either, we thought sort of strange for a weekday afternoon though. Then a teenage boy emerged from the barn a little sheepishly, breathless and with high color in his cheeks. He told us that everyone was at a wedding and that he was the only one home… Okay, it made sense now, this boy was the driver! Just like a lot of teenaged boys, out for a bit of fun, excitement and some daredevil maneuvers in a family vehicle, when no one was around looking… well no one except for us. I’ll never forget the surprise and excitement of seeing that speeding wagon or the lesson in the sameness and humanness of all of us from that teenage boy. That horse is a great sport. Not to mention, well-trained. Haha! That’s great that they’re having fun and killing time. Just goes to show that the Amish also like to have fun and goof off like any of us. Those were some tight circles for that horse AND buggy to turn in, I don’t think the horse seemed to mind (I wonder if he’s used to it!) but someone’s father is likely going to notice when excessive, odd wear patterns and loose parts start to show on just one side of that buggy *grins*. Just glad for the horse’s sake the buggy doesn’t skid like my car did when I tried doing donuts in a snowy, empty parking lot a long time ago! I remembered when I was young I did a few snow donuts myself in my 76 Gremlin car. It was so fun until a partrol car told me to get going. It was so much fun anyway.